Your fussy baby finally falls asleep for her afternoon nap and you sit down for a much-needed moment to yourself only to hear the sounds of the UPS truck rolling into your driveway with the squeaky breaks and the slam of the cargo door. (Nothing against our UPS man. Brandon, you are amazing! Keep those Amazon packages coming.) But, just like that, Sleeping Beauty is wide awake and mad. NOT a good combination. Or maybe you live in the country and you’re awoken at dawn by the glorious, yet annoyingly loud sounds of birds chipping outside of your window. Birds chirping = good, just not at 5:00 am. Environmental noises are a fact of life that you can’t do much about, but there IS something you can do about your baby’s/your ability to sleep through the noise. In my experience, white noise machines can be a lifesaver when it comes to helping people of all ages fall asleep and stay asleep. 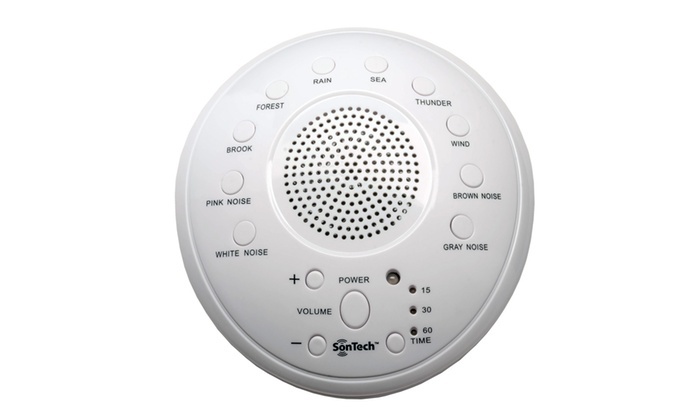 There are lots of options out there, but I like to use the SonTech White Noise Sound Machine (see photo below). This is a small, simple-to-use device that creates sound that blocks out a lot of these day-to-day noises and won’t break the bank ($20 bucks). This machine has a variety of “color noises” such as white, pink, grey, and brown noise. Some people will play lullabies or use crashing waves. This is better than nothing; however, I always tell my clients if you are going to buy a sound machine, get one that has the color-noises. The reason for this is that the brain is constantly trying to pick up on patterns in order to make sense of our environments. It may try and pick up on or predict the melody of the lullaby, or count seconds between each ‘wave’. Our subconscious is also a tricky thing that will easily link emotional connections to different sounds. (And for anyone that says their mind races…..EEK!) For example, if I hear a thunderstorm setting on a sound machine my mind is immediately taken to the movie Twister. Then I can’t stop thinking about cows flying through the air….Oooh, I need to pick up hamburger at the store tomorrow….Was there a coupon for that in the paper?…..Ugh, my credit card bill was in the pile with the paper.……Damnit, I need to pay off that card…..Where did I put the Dave Ramsey book? I went from a calm thunderstorm, which was supposed to put me to sleep, to Dave Ramsey! WHAT!? People will then ask me, what’s the difference in White vs. Pink/Grey/Brown noise? The answer is frequency. White noise is a higher and brown is lower……think brown note (insert poop emoji). Which one is the best for sleep? The one that you find the most calming. I, personally, like brown noise best. And although it might seem unnatural to create noise when you want to go to sleep, remember: it wasn’t exactly soundproof in the womb! Your child is actually quite used to noise by the time she’s born because she’s been listening to you talk, your stomach gurgling, and the sound of the family and the TV and the car radio while in utero. Believe it or not, complete quiet can actually be more confusing to a newborn than background noise. One of the biggest benefits of the white noise machine is that it helps babies fall back to sleep if they wake up. This means their nap times will last longer and they will be less likely to fully wake in the night. The main concern parents have about trying this is usually about their child or themselves becoming “addicted” to white noise, and that is a valid point. My experience is that there is absolutely no need to worry about this. A white noise machine IS NOT being used as a sleep prop like a soother or being rocked and sung to. It is there to block out noises that you can’t control that might be waking your child. When you’re ready to wean off the machine, simply turn the volume down a little every night until you’re not using the sound at all. Make sure the machine is at least 6 feet from the head of the crib or your bed. Keep the noise machine on all night long. Do not use a timer. Cover the power light on the noise machine with black electrical tape. Use sounds like “White, Grey, Pink, or Brown Noise” so your brain/subconscious is not trying to pick up on any patterns or connections. Newer PostIs melatonin right for my child? Older PostHow to Handle Your Child's Early Morning Wake-ups.